In this satirical homage, comedic actor and Lady Gaga tribute artist Athena Reich ponders what it might be like if the gay-adored pop star decided to give birth in front of an audience of her rabidly devoted fans. I loved #Artbirth. So original and hysterical! 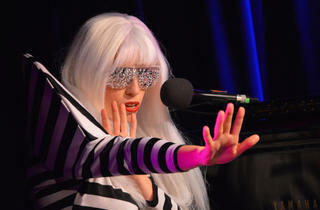 Athena Reich is an amazing Lady Gaga impersonator and to add the element of Pregnant Gaga makes it so funny! Love this show, full of artistic flare and surprise. A must see!!! What a great talent. The show is full of energy and wonderful humor. I loved it. Athena Reich is so spot on as Lady GaGa, that GaGa herself even gave Athena permission to use her likeness whenever and however she wants! #ARTBIRTH is intelligent, HILARIOUS and outrageous - just like GaGa herself! And c'mon, who doesn't love glitter barf? WERK it, Athena WOMAN! We love you! I was at this same show and l loved it! I cannot wait to see it again! The music, dance and writing were hilarious and thought provoking. The funniest thing I have seen in awhile. Just incredible. Athena has this unbelievable voice that really astounded me. She looks and sounds so much like GAGA I sometimes forgot she wasn't the real thing. And I laughed so hard that my voice was hoarse after. I am weary of tribute shows in general but after I saw the press she was getting in Billboard and on Page 6 I was really curious. This is beyond a tribute show. It's a hilarious piece of theater that is so innovative and interactive that it was thrilling. I'm going back again this week and bringing more friends. It's so different from other theater I've seen that I just need to see it at least one more time. Did the "critic" actually see this show? Because i'm sorry to say I had to sit through that mess. I was brought to the show by my friend Friday who is a Gaga freak. As a gay man I support all LGBT theatre as much as I can in NYC, but as a theatre lover this was disappointing. The script was weak and the lead actress seemed to think she was much funnier than she actually is. Just didn't work for me as a show. The whole production from dancing to costumes seemed like a high school production, not NYC quality. I found it almost unbearable to watch. Do yourself a favor and skip it.